Greek | The Sassy Spoon: Fun Food! This recipe is so good that I revisit it every few months. It makes a great centerpiece for a dinner party and the leftovers are better than the first night’s meal. The noodles are difficult to find, but I get them on Amazon.com, buying 6 bags at a time. 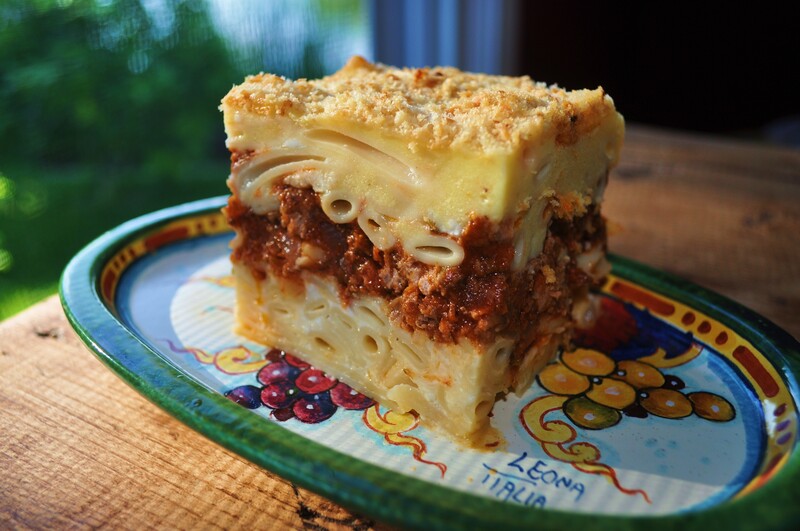 When teaching others to make this dish, I have often joked that the word pastitsio (pa-STEE-tsee-oh) translates to “messy kitchen” in Greek. I was only kidding, but there is a hint of truth to that statement. 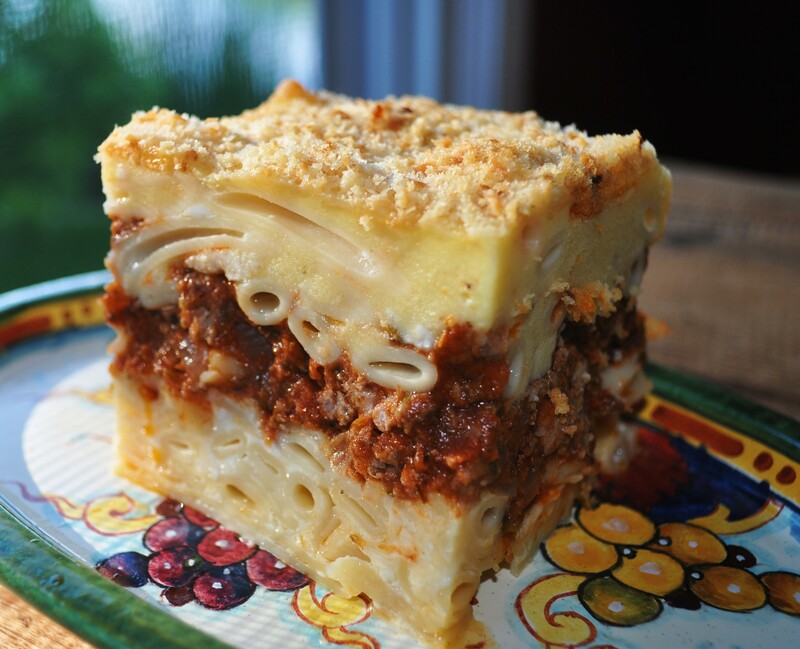 The Greek word pastitsio derives from the Italian pasticcio, which loosely translates to a mess or a hodgepodge. Three essential components make up this dish – pasta, meat filling, and a creamy bechamel sauce which are layered in a pan and baked to a golden brown. Each stage will require dirtying some pots and pans, but I think you will agree that the end result is well worth the clean up! 1 pkg. 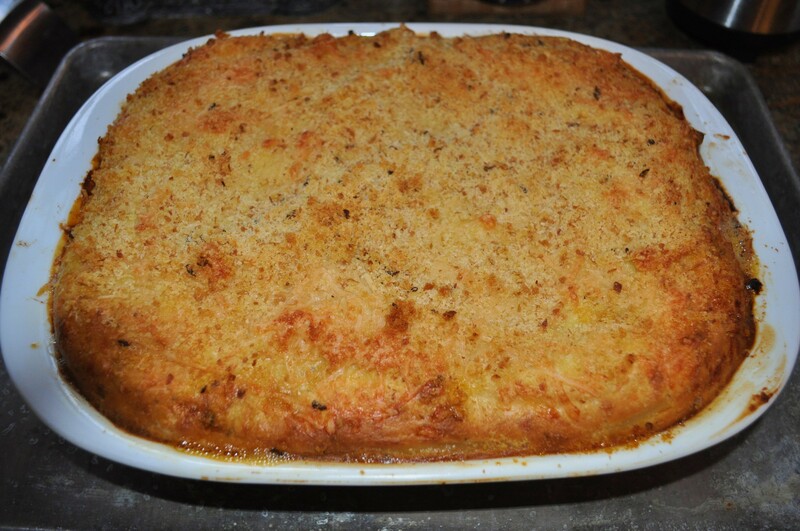 #2 Macaroni for Pastitsio (500g)- available at Greek or ethnic groceries. This recipe will yield about 12 servings depending upon the size of your pieces. I use a lasagna pan that is 9 x 13 x 3 inches deep. Heat olive oil in a large saute pan. Add ground lamb and cook over medium-high heat until pink color disappears, about 5 minutes. Add onions and cook until they are translucent, about 5 minutes more. Add wine, tomato sauce, parsley, allspice, cinnamon, salt, and pepper and allow sauce to simmer over low heat for 10 minutes. While sauce is simmering put water on to boil for pasta. Cook pasta noodles according to package directions and drain well. Rinse noodles in colander under cold water to cool them slightly. Stir in 3 tbsp. breadcrumbs to meat sauce to absorb excess liquid and remove from heat. Melt 1/2 cup butter in pasta pot and return cooked noodles to the pot. Stir in beaten egg whites and 1 cup of grated cheese and toss lightly, being careful not to break the noodles. Brush the bottom and sides of the lasagna pan with olive oil. Layer the bottom with half the pasta noodles and press down so that they are somewhat flat. Add the meat filling in an even layer to the pasta. Top with remaining pasta noodles and flatten top layer as best you can. Pre-heat the oven to 350 degrees while you prepare the bechamel sauce. Melt butter in a saucepan over low heat. 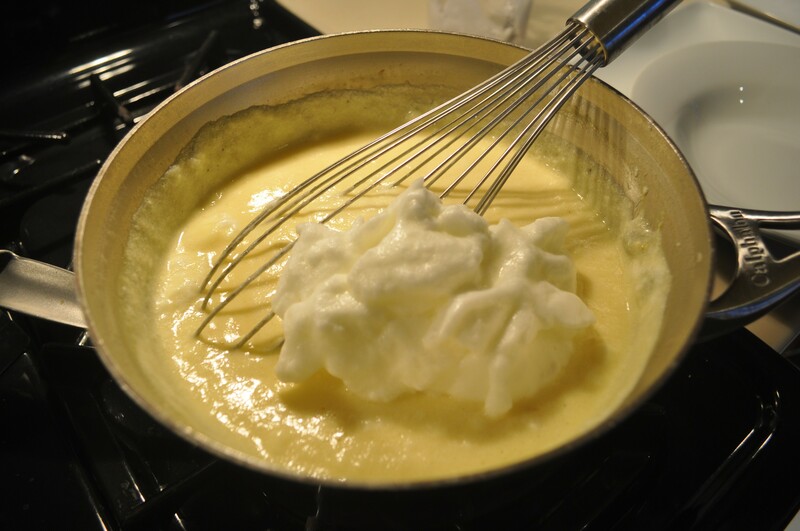 Using a whisk, add flour to melted butter whisking continuously to make a smooth paste or roux. Allow the flour/butter mixture to cook for a minute but do not allow it to brown. 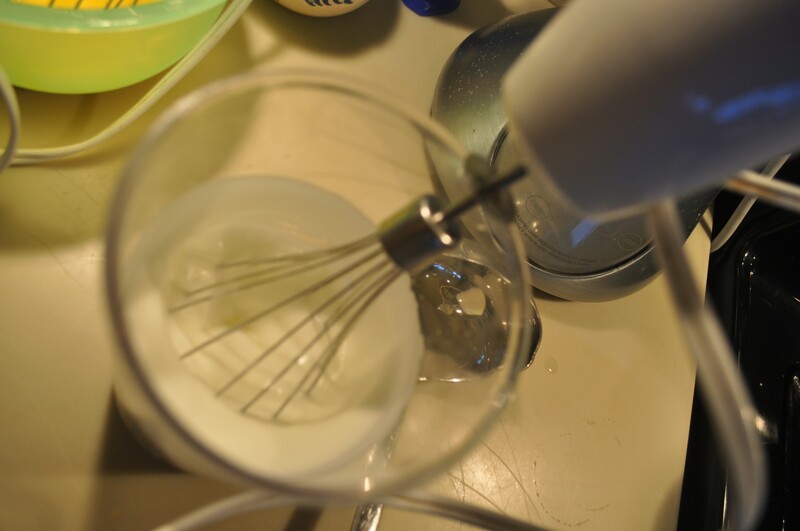 Add warmed milk to mixture in a steady stream, whisking continuously. Simmer over low heat until it thickens but does not boil. Remove from heat and stir in beaten egg yolks. Add pinch of nutmeg. If sauce still needs to thicken, return to heat and cook over very low heat while continuing to stir. Bechamel is thicker than gravy but not quite as thick as pudding. It should be somewhere in between. One way to tell if it is thick enough is to dip your wooden spoon in the sauce and draw your finger across the back of the spoon. If the sauce holds a visible line then it is thick enough. Pour the bechamel over the pasta noodles making sure to pour sauce down in to the corners as well. I even pull back th sides of the pasta to let some go down the sides. Sprinkle with remaining 1/2 cup of grated Parmesan cheese and bread crumbs if desired. Bake in 350 degree oven for approximately 45 minutes or until the top is a nice golden color. Spanakopita! Fun little hand pies filled with nutritious spinach and feta. 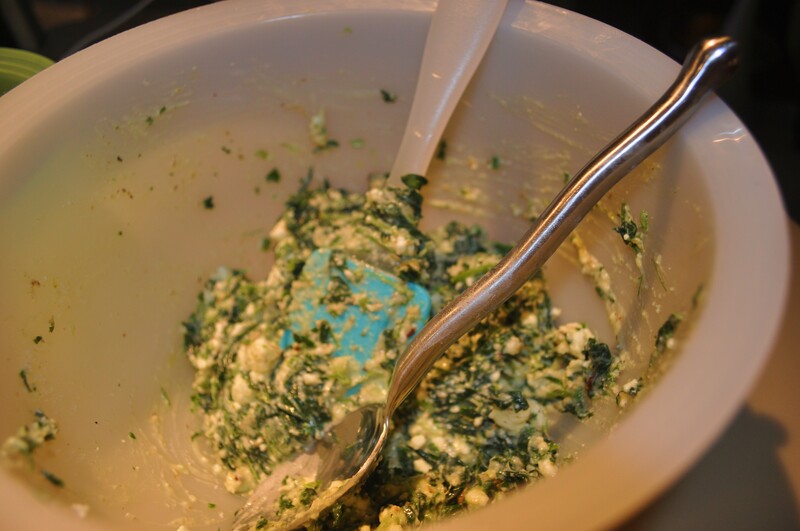 2 (10-ounce) packages frozen chopped spinach, thawed and drained, I squeeze out the excess juice using a potato ricer. 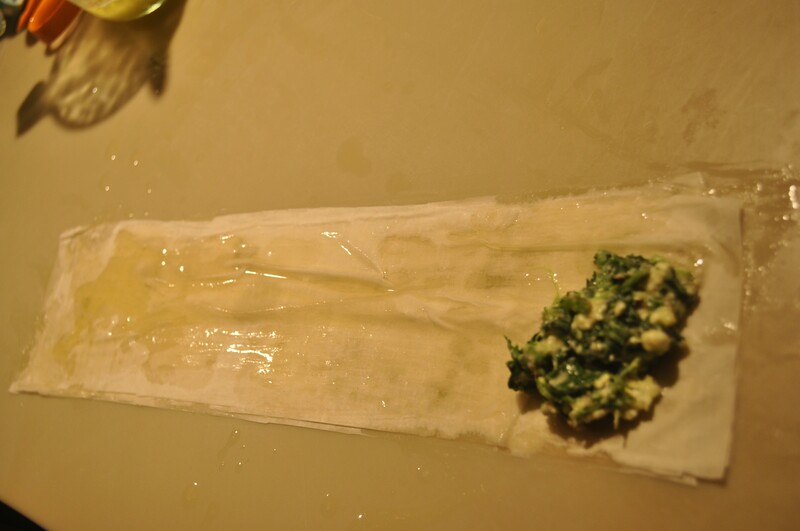 Using a pastry bush apply a thin coating of butter to a strip and repeat with 3 more strips. 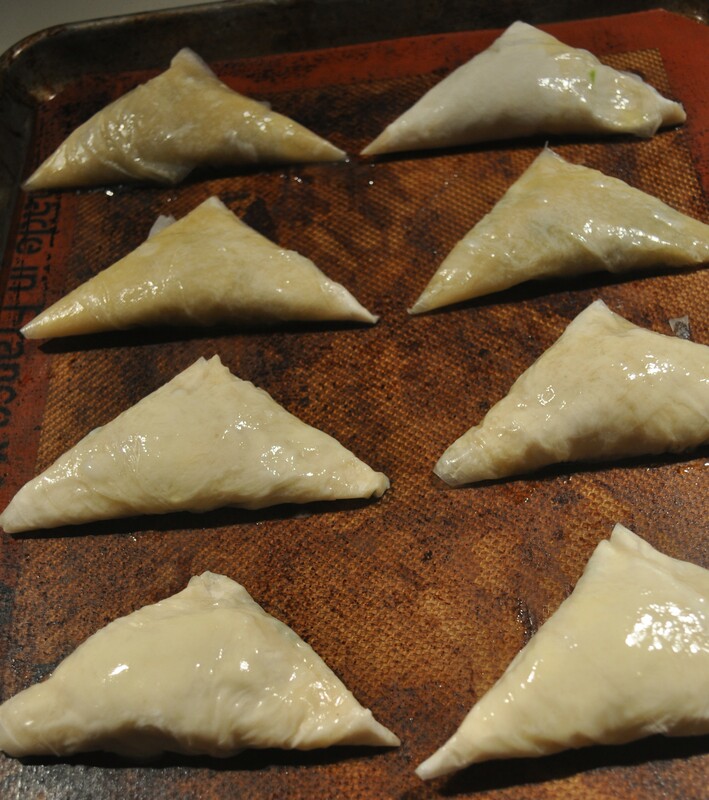 Add a dollop of the filling in one corner and fold over and over in triangle shape. 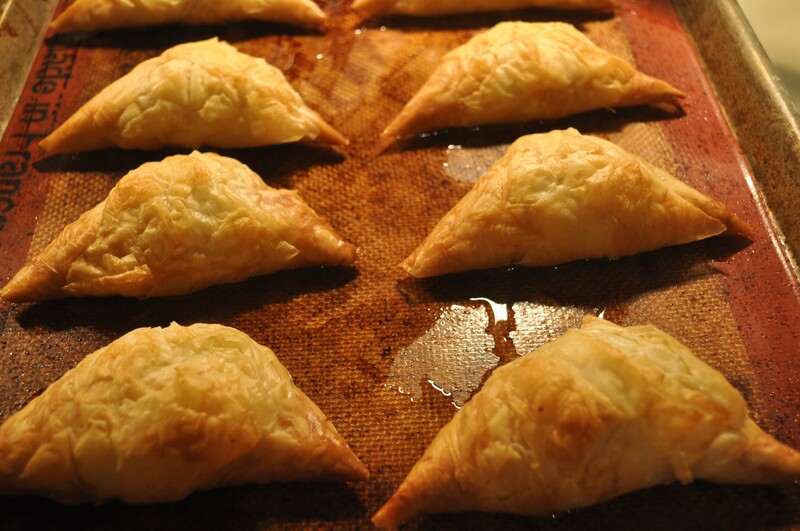 Repeat this process until you run out of filling or phyllo. Bake at 425° for 20 minutes or until golden brown. 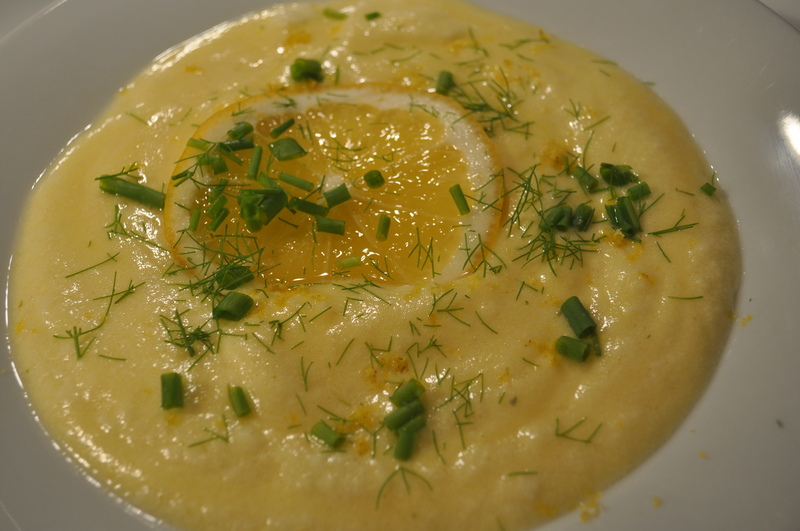 In just 30 minutes you can whip this amazingly flavorful soup up. It is good hot or chilled. 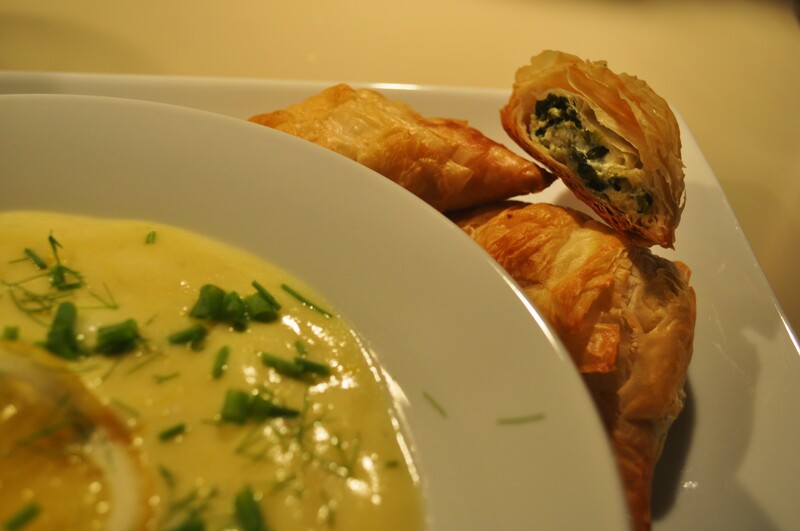 I served it with Spanakopita (click for the recipe). Marry 1/2 cup of the stock/rice/yolk mixture to the egg whites, then fold that mixture into the stock/rice/yolk being careful not to deflate. Taste for salt and lemon juice, adding more as needed. 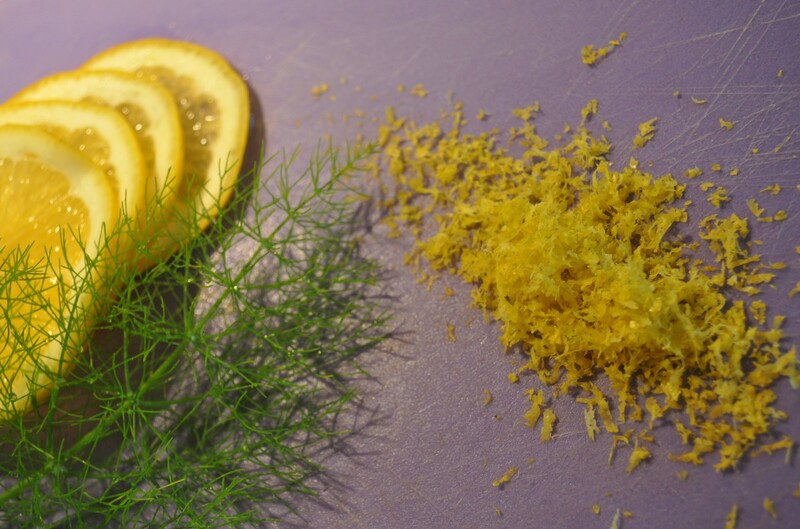 Ladle into warm bowls (or allow to chill and serve in stemmed glasses), sprinkle with herbs and lemon zest and add one lemon slice. Yield: 4 to 6 servings. This does keep well in a covered container, but should be used in 1-2 days and be very careful when re-heating not to allow it to boil.